Costa Rican politician and writer, who, as of April 2018, serves as the 48th President of Costa Rica. 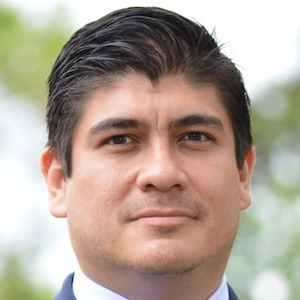 He is a member of the Citizens' Action Party, and is the youngest Costa Rican president since Alfredo Gonzalez Flores. He has had an award-winning literary career, known for his novels The Story of Cornelius Brown and The Possessions. He has a bachelor's degree in communication and a master's degree in political science from the University of Costa Rica. He went on to receive a master's degree in developmental studies from the University of Sussex in the UK. His Vice-President, Epsy Campbell, is the first Afro-Costa Rican to hold that office. His wife is architect and urban planner Claudia Dobles Camargo. Their son Gabriel was born in 2013. Former Costa Rican Presidents include Laura Chinchilla and Luis Solis.